BenQ, “Bringing Enjoyment ‘N’ Quality to Life”, continues enhance the areas of life that matter most to people – that have the greatest impact on the enjoyment and quality of LIFE today. 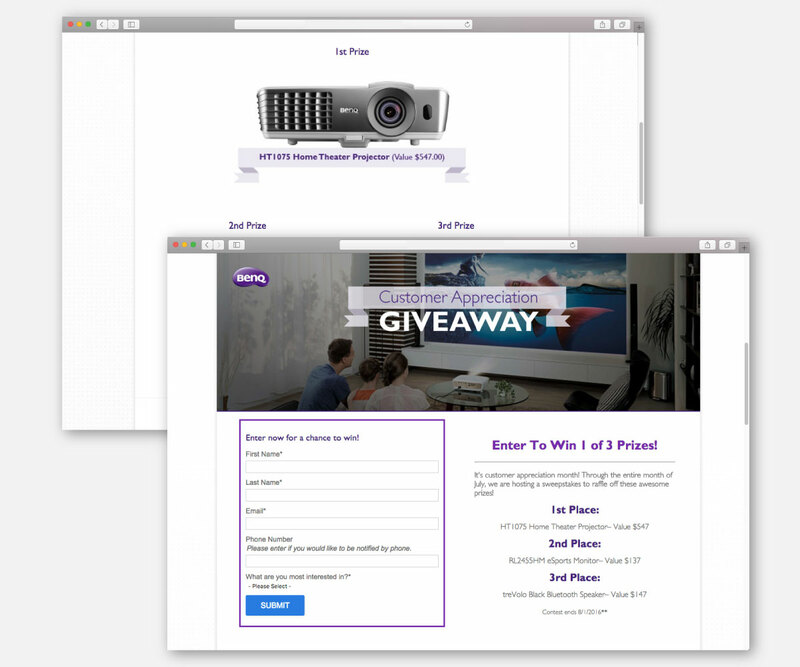 BenQ reached out to EYEMAGINE for help increasing conversion rates. EYEMAGINE designed a successful landing page as part of an inbound marketing campaign. The campaign achieved an 83.49% conversion rate, generating 1,651 new self-segmented contacts. According to Search Engine Land, “the average landing page conversion rate is 2.35%, yet the top 25% are converting at 5.31% or higher. Ideally though, you want to break into the top 10% — these are the landing pages with conversion rates of 11.45% or higher.” This 83.49% conversion rate broke the mold. Prospects submitting the form on the landing page entered to win one of three prizes: a Home Theater Projector, an eSports Television Monitor, or a Black Bluetooth Speaker. The overarching goal of the campaign was to improve the long-term effectiveness of BenQ’s marketing strategies. The most effective marketing strategies accurately target a company’s buyer personas by addressing their interests or problems. BenQ had many unsegmented contacts and, therefore, could not be effectively targeted. This landing page solved this problem by leveraging an auto-segmenting tactic used in most, if not all, of our landing pages. Specifically, this landing page offered high-value items and asked for very basic information in return. According to Hosting Facts, over 40% of global internet users - more than 1 billion people - have bought products or goods online. Overall, this led to over $1.7 trillion in B2C eCommerce sales in 2015. The form itself is very straightforward and asks for very little information. In this case, the little request is the information for a free offer. The larger request down the line could be a discounted purchase or, if the experience is very positive, a full-fledged sale. The question “What are you interested in?” allows BenQ customers to segment themselves into one of the company’s many buyer personas. This is crucial for the success of future marketing efforts, as it will enable more targeted, effective campaigns in the future. The landing page design is intuitive and highly effective. There are no videos, blogs or links distracting visitors from submitting their information. Instead, the content and imagery focus the audience and speak directly to the buyer personas’ interests, offering them a chance to win high-value products for free. This gives potential customers a low-risk opportunity to engage with the brand. This approach effectively increases customer confidence, especially when it comes to premium product. BenQ offers a wide range of electronics, and we made sure to provide a variety of options for this campaign. 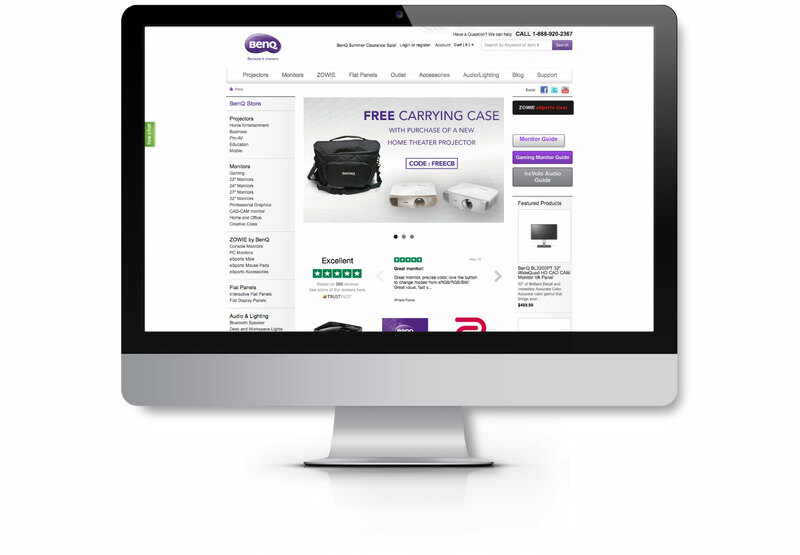 Most BenQ customers are looking for specific electronics at a specific point in time. A customer interested in a new projector, for example, may have already purchased a television and speakers. By providing one product from each of their main product categories, we ensure higher click-through rates and conversions on the landing page. SEE ALSO: How Do You Product Pages Stack Up? The landing page explicitly states that the products offered are high value: the Home Theater Projector is worth $547, the eSports Monitor is worth $137, and the Bluetooth Speaker is worth $147. This immediately interests site visitors - this is their chance to get something great just by completing a form. On top of that, the offer is exclusively for BenQ customers and only valid through the month of July. This use of the scarcity principle, explained by Cialdini as the idea, “that opportunities seem more valuable to us when their availability is limited,” creates a clear sense of urgency for the audience: opt-in now or miss out on something valuable. The sign of a well-executed giveaway offer is that it generates true interest: 22.5% of total submissions came from referrals. This level of shareability was achieved by creating an inbound marketing campaign that had universal appeal to an already-interested audience. The risk-free offer spoke the audience’s language, providing extreme value. This case study illustrates the effectiveness of a fully integrated inbound marketing campaign. There is no silver bullet, but having a complete understanding of an audience and a strong marketing strategy is essential for generating eCommerce results.